Netfloor USA CamassCrete is a low profile access floor with built in cable management Comprised of traditional steel panels with a concrete core. Available in heights from 1.5"-8", fully adjustable +/- 1". CamassCrete has all the features of a traditional access floor in a low profile floor height that's easier to use. Netfloor USA CamassCrete is a high-strength, flexible cable management access floor utilizing traditional steel panels with a concrete core. Adjustable, low profile pedestal legs can accommodate minor subfloor variations or imperfections by using the adjustment screw and locknut. As the CamassCrete floor is installed, it creates built-in cable trenches in a 2'x2' grid pattern, perfect for running power and data cables anywhere in the room. Height ranges from 1.57"-6". This is the Cable Management Floor to use if you like standard access floor panels but need more flexibility in running cables! 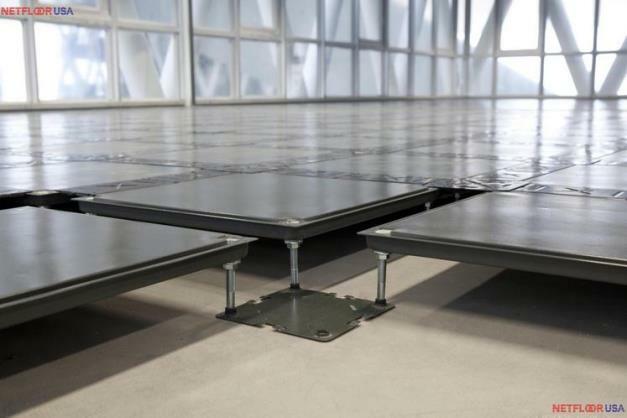 This is the perfect cable management floor for users with good experience with a traditional access floor (which often have concrete + steel panels.) 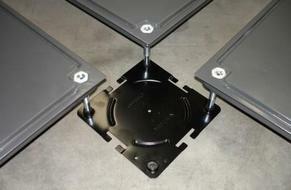 It is easy to transition from a stanard type raised floor to a Netfloor USA CamassCrete floor. The major difference is that this floor system has built in cable trenches and electrical/data floor boxes, which make installation and operation of the floor and wiring systems easy. The Netfloor USA CamassCrete brochure is available here. Netfloor USA CamassCrete is the 'best of both worlds'. You get access floor panels made from steel and concrete, just like you're used to. But you get built-in cable raceways, trenches, floor boxes and cable management. Oh, and did we mention CamassCrete ranges in height from about 2" to 12"? Sounds pretty nice, right? Go ahead and download our specifications to use on your next project, or to get detailed information about Netfloor USA CamassCrete Low Profile Access Flooring! Questions, Need Pricing or Have Comments? Sorry for the CAPTCHA; We hate SPAM as much as you do!